And touchdown will occur on April 11, if all goes according to plan. 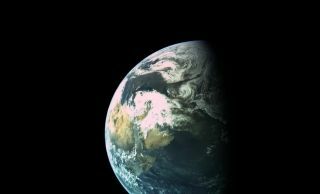 Israel’s Beresheet lunar lander captured this image of Earth on March 31, 2019, from a distance of about 9,940 miles (16,000 kilometers). The Arabian peninsula and southeastern Africa are visible. Israel's Beresheet lunar lander has almost made it to the moon. The 5-foot-tall (1.5 meters) Beresheet fired its engines for a little over a minute early this morning (April 1), altering its trajectory slightly to prepare for a planned capture into lunar orbit on Thursday (April 4). If all goes according to plan, the robotic lander will touch down on the moon one week later, on April 11. That will be a huge milestone. To date, the only organizations to pull off a soft lunar landing are superpower governments — the Soviet Union, the United States and China. Beresheet, meanwhile, is a private effort run by the nonprofit SpaceIL and the company Israel Aerospace Industries. SpaceIL formed in 2011 to compete in the Google Lunar X Prize (GLXP), a $30 million competition that asked privately funded teams to land a spacecraft on the moon and have it perform a few basic tasks. The GLXP ended last year without a winner, but SpaceIL and some other teams kept working on their moon landers. Beresheet, whose name means "in the beginning" in Hebrew, launched into Earth orbit atop a SpaceX Falcon 9 rocket on Feb. 21. Since then, the spacecraft has performed a series of orbit-raising maneuvers to get closer and closer to the moon. This morning's 72-second-long burn helped make some "final adjustments" ahead of capture into lunar orbit, mission team members said in an update this morning. It's unclear if any further such tweaks will be needed. "The teams are assessing the results to determine if another alignment will be required before Beresheet enters the lunar orbit this Thursday," project team members said. Beresheet made its last close approach to Earth yesterday (March 31), zooming within 1,056 miles (1,700 kilometers) of our planet, they added. The lander snapped a gorgeous photo to commemorate this passage, capturing Earth from a distance of about 9,940 miles (16,000 km). The image shows the Arabian peninsula and southeastern Africa; thick clouds cover Israel, Beresheet team members said in today's update. Beresheet will perform some science work at and around the moon. For example, the lander will measure local lunar magnetic fields, and it's toting a small laser-reflector array for NASA to help prove out technology that could enable more precise landings on the moon and other bodies in the future. Beresheet is also carrying a "lunar library" to help safeguard slices of human history and culture. But the main mission goals are to advance Israel's spaceflight program and to inspire young people to care more about science, technology, engineering and math. Beresheet's total mission cost, including launch, is about $100 million, team members have said.